The Norman House is one of York's hidden treasures, standing in a secluded courtyard accessed through an archway from Stonegate. 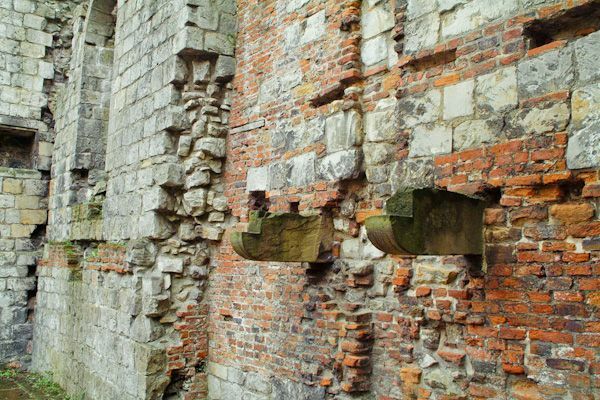 The house was built of freestone about 1180, and it is the oldest house in York of which any substantial remains still stand in place. 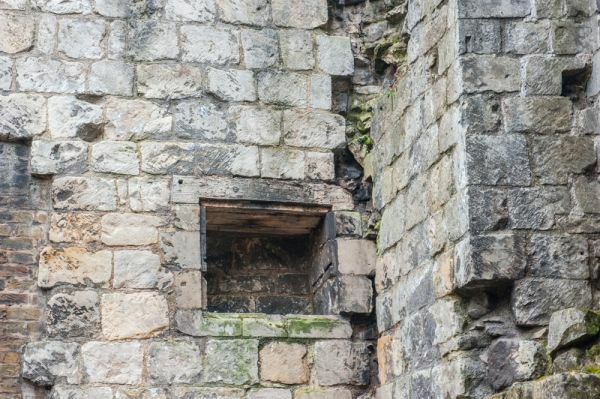 It is also the oldest example of domestic stonework still in its original location. 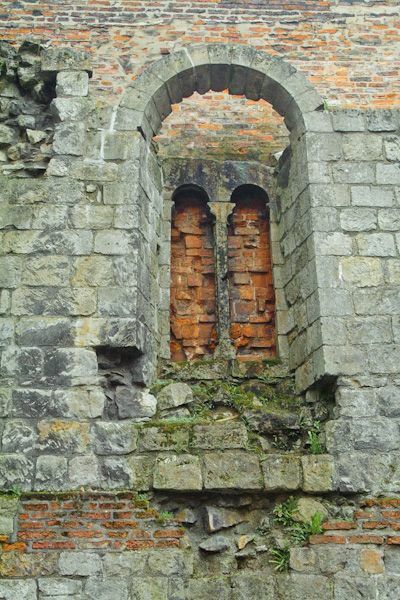 There are two walls and nicely preserved first-floor windows with fine tracery. 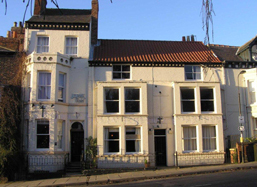 The house area was restored by the York Civic Trust in 1969. 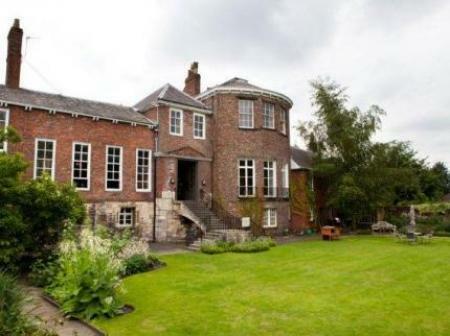 The house served at one time as a Prebendal house of Osbaldwick, a village near York, and a later house on the site was used by clergy serving York Minster until the 19th century. 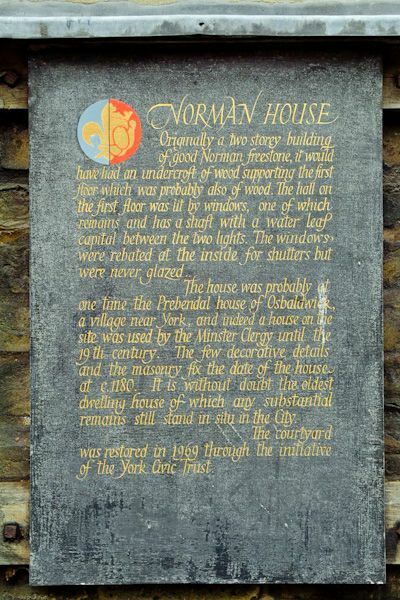 The Norman House was discovered in 1939, and one immediate question that needed resolving was if the stone building was a house or an ecclesiastical building. 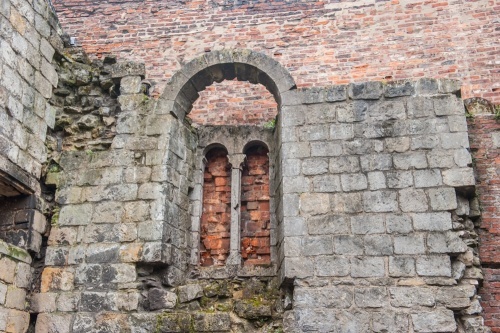 Examination of the surviving window openings showed that they were unglazed, with a metal bar for safety - thus we can be fairly certain that it was a domestic house. Another discovery made by archaeologists was a medieval toilet - an unusual domestic survival. The house would have had a hall on the first floor, and a red stone line on one wall shows the location of the floor level. At ground level, there would have been an undercroft, used for storage. Who lived at the Norman House? 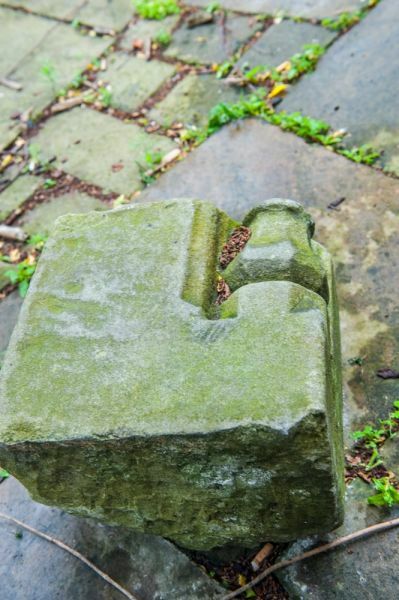 The short answer is that we don't know, but what we do know is that they were people of status; stone was by far the most expensive building material in the 12th century, so whoever built Norman House had no little social standing and obviously a good deal of disposable wealth. Compare the stone-built Norman House to the quite substantial yet completely timber-framed structure of nearby Barley Hall. The Norman House is reached through an arch between number 50 and 52 Stonegate. It won't take long to visit, but its worth a side-trip to get a glimpse into domestic life some 800 years ago! 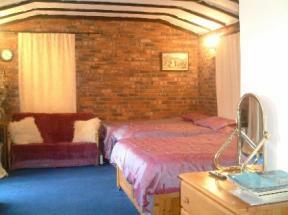 Location: Located just behind Stonegate. Open access.